OK, what I’m about to say may just break your heart. We have come to the end of the Mason Jar Era. I know, I know. You can’t believe it! You don’t believe it! You down right refuse to believe it! I’ve been working on our newest issue—out soon, I promise—and in speaking with several wedding industry pros, I’ve heard more than just a few exasperated gasps when I mentioned the infamous Mason jar. Somehow, this simple kitchen item has become the wedding planner’s archnemesis. Before 1859, when the Mason jar was patented, preserving food was a nightmare. We don’t need to go into the details here, but just know that it wasn’t pretty. When John Landis Mason invented the Mason jar, home cooks rejoiced (or at least, that’s what I imagine). With transparent glass and a design that creates a hermetic seal when turned shut, the Mason jar was heaven sent. Eventually Mason jars become fodder for modern collectors, who now search out antique versions at flea markets and online auction sites. And at some point during the last few years, brides adopted the Mason jar as their very own. They’ve used them as vases, as candle holders, as cups for signature cocktails or lemonade. They’ve been covered in burlap, ribbon and sprayed with gold paint. They’ve hung from trees, perched on ledges and sat on feasting tables. While Mason jars are not necessarily old school or archaic, they have been done…and done…and done. And now it’s time to do something else. So Colorado Brides has come up with a list of alternatives. Milk bottles create a clean look, and they harken back to a more simple time (or maybe, a more complicated time, when we didn’t put everything in plastic). Like Mason jars, milk bottles say “this is a casual wedding but we still want to impress you with our creativity. See also glass soda bottles. The Mason jars obsession, we think, began with the trend of eclectic weddings. Brides want weddings that are—ironically—unique, individualized and eclectic. And somehow, Mason jars became that poster child for Anthropologie-ish weddings. 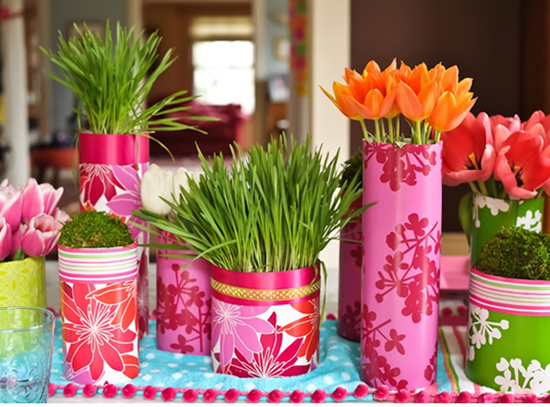 One amazing way to show your personal style through your vessels is by wrapping simple glass or plastic containers or vases in paper or fabric. Go colorful or simple, patterns or solid. Even try lace.